This paper, by Paul Manning from the University of Winchester, has some really interesting analysis of the sorts of films being uploaded to YouTube about drugs, the substances being discussed, and the intentions of the film makers. After yesterday’s rather sombre reminder that drugs and alcohol remain amongst the highest risks for the death of young people in Western Europe some rather better news. The annual report into drug deaths from St Georges says that deaths amongst those aged 15-24 in England appear to have dropped over the past ten years by about 60%. The report tells us that overall the number of deaths associated with drug use in the UK has fallen by 6.7% in the last year. They say there were 1,757 notifications of drug-related deaths occurring in 2011 in the UK and Islands. One-in-four students at British universities admitted to having taken ‘legal highs’, of whom 39 per cent said they had experimented with salvia. Salvia is one of the most powerful known hallucinogenic herbs. Over half of university students (54%) admit to taking some form of illegal drugs since they have been at university. Unsurprisingly cannabis is the most common drug tried at uni – 77% of those who have tried an illegal drug have tried cannabis. Ecstasy / MDMA (39%), cocaine (24%), Mephedrone or meow meow (18%) and legal highs (17%) were also cited amongst students as drugs they have tried since starting university. What they don’t say is what their methodology was for conducting their survey so we need to treat the results with some caution. And I note that the most recent Home Office analysis of the Crime Survey for England and Wales, report that 14.6% of students said that they had taken a drug in the last year. 90% of students think that their peers have tried illegal drugs whilst at university, whilst in reality almost half of respondents (45%) have never tried any form of illegal drugs. I wanted to find a nice statistic for the overlap between cigarette smokers and cannabis smokers, so I had a look at one of the tables in Smoking Drinking and Drug Use 2011. Which was interesting. The headline statistic is that among 15 year olds surveyed in 2011, of those who had smoked tobacco in the past week, half reported drug use in the past month. This compares with 4% of ‘non-smokers’ (during the past week). ‘Risk-taking behaviours’ tend not to be in isolation, and it’s unsurprising that tobacco smokers would be more likely to smoke cannabis as well (other illegal and illicit drugs are less common among young people) but this is a very stark figure. Abstracts in academic literature often give an interesting but not always comprehensive view of what is contained in the paper. This one reports on an analysis of a large population-based birth cohort (1970 British Cohort Study) to look at whether there was a correlation between a number of measures including cannabis and cocaine use, parental social class and psychological distress at 16 years; cannabis, cocaine, amphetamine, ecstasy and polydrug use (more than three drugs) in the past 12 months; and social class, educational attainment and gross monthly income at 30 years. The authors conclude that high childhood IQ may increase the risk of illegal drug use in adolescence and adulthood. These findings suggest that targeting young people at risk of social exclusion may miss an important cohort of future drug users. The Children and Young People’s Health Outcome Forum have reported to the Department of Health. This report will inform a strategy for young people’s health that the DH have said they will produce this summer. Effective delivery of public health services requires the commitment of staff and organisations which are outside the direct control of the health system but are core partners to it. The new health and wellbeing boards bring tremendous potential – to connect schools, the environment, housing and safeguarding services for example, all to improve health outcomes. The World Health Organization (WHO) has developed the concept of youth friendly services, emphasising that services that provide young people with good experiences are more likely to be effective and used. Based upon this, clear quality criteria for adolescent-friendly health services were developed, validated and published by the DH in 2007 – You’re Welcome. Local authority commissioned drug, alcohol and sexual health services also need to be youth friendly and sensitive to the needs of both young men and women. This means being confidential, in the right place, open at accessible times and well publicised to reduce the stigma of asking for help and encourage young people to seek early advice. Involving young people in the JSNA (such as through Healthwatch, chapter 2) will help local authorities design services around how young people in their areas live their lives, rather than around professional boundaries, and provide a more coordinated approach to prevention and support. The duty on local authorities to provide services and activities to improve young people’s well-being provides another opportunity to integrate health advice into youth settings and other services young people trust. The Forum recommends that the NHS CB, all clinical commissioning groups and LA commissioners of public health services, commission services in a way that ensures that teenagers are managed in age-appropriate services – either in paediatrics, adult services or dedicated young people’s services – and that a measure of this is included in the NHS Outcomes Framework. All services for teenagers should be commissioned using the quality criteria outlined in You’re Welcome. From where I stand if these recommendations are taken up by Ministers then young people will be in a much stronger position when it comes to the proper development of effective preventative drug services. 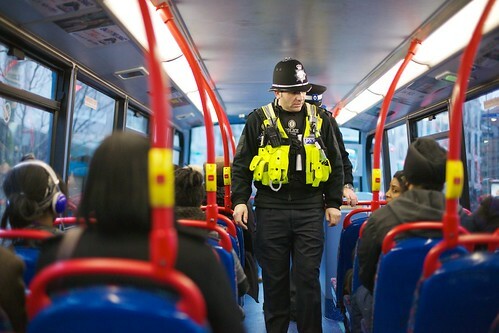 Day 8 – Safer Travel Police on Birmingham buses – West Midlands Police, a photo by West Midlands Police on Flickr. The government have published their anti-social behaviour white paper. It has one or two things that will be of interest to us, particularly in the context of some of the programme work we’re thinking about. They say that half of violent crime is alcohol related and that a quarter of the public think people being drunk or rowdy in public places is a very or fairly big problem in their local area. The civil standard of proof requires proof ‘on the balance of probabilities’ rather than ‘beyond reasonable doubt’ which will make injunctions quicker to get. This means that problem behaviour can be addressed more quickly. Police officers and other professionals can give evidence on behalf of the community, which protects vulnerable witnesses. The new injunction contains support to change behaviour rather than just stopping the person from doing something. This should help reduce re-offending. Sanctions for breach are civil not criminal, which prevents people getting a criminal record unnecessarily.